“Sales for the six months ended 30 September 2015 were £65.0m (2014 – £63.6m) with profit before tax of £9.51m (2014 – £8.34m). Sales revenue has been affected by the general reduction in raw material prices during the period making it difficult to directly compare to the previous year. It was reported at the Annual General Meeting in August that sales volumes were maintaining at reasonable levels. It appears for the next three months that orders and schedules will remain at a similar level. I am not too worried about the reference to revenue being affected by the lower cost of raw materials. CGS’s annual report says the group’s sales contracts contain price-adjustment clauses, which suggests an element of revenue is dictated by external commodity values. Importantly for me, CGS confirmed sales volumes had been maintained and, with H1 operating profit up 14%, I’m pleased full-year earnings ought to progress further. These results emphasised CGS’s respectable accounts. The group’s operating margin was a decent 14.5%, and I see the Machining division scored a healthy 26% margin before central costs. Indeed, profit at the Machining division gained an impressive 38% to £2.6m. 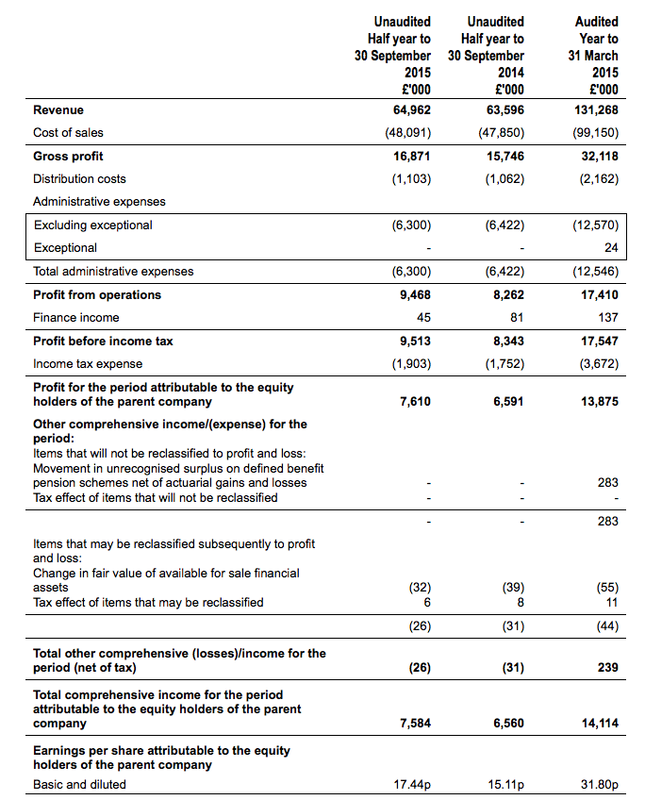 Cash flow looked fine to me, too, with the bank balance adding almost £2m to £32.3m. The balance sheet continues to carry no debt as well as a £6.8m refund that’s due from the company’s over-funded pension scheme. Trailing operating profit now runs at £18.6m, which after 20% standard tax would equate to earnings of £14.9m or 34.1p per share. Subtracting the £32.3m, or 74p per share, net cash position from the £196m market cap, my estimate of CGS’s enterprise value (EV) is £164m or 376p per share. Dividing that 376p per share by my 34.1p per share EPS calculation gives a multiple of 11 at the present 450p share price. That rating does not look expensive to me. Meanwhile, the interim dividend was upped 5% and the trailing payout now comes to 13.46p per share to support a 3.0% income. * Next events — ex-div 27 November, 3.38p dividend paid 4 January 2016, annual results June 2016. Maynard, appreciate the blog as always find educational. I just want to ask re your valuation & the cash pile. If Castings aren’t putting the cash to any ‘productive use’ should I be subtracting the cash when calculating a valuation? I can see point if I was purchasing the entire business, or if a takeover is likely. But in this case where Casting appear happy to just let it grow i.e. not adding to their ability to boost future earnings, I’m tempted to either discount the full amount in some way or exclude entirely. Good question. I always look at EV, adjusting market caps for ‘surplus’ cash and loans etc. That way I get a feel for how the underlying business is valued by the market regardless of capital structure. I think you should be at least factoring in the cash when considering a valuation. The cash exists and the fact it is just sitting there not doing anything does not mean to say it less valuable than cash that is earmarked for a productive use. In fact, I would say cash just sitting there could be more valuable than earmarked cash, because the latter could be wasted. Companies with large cash resources tend to be conservatively run and the presence of cash does reassure customers that contracts will be fulfilled and the business will be around next week. I recall visiting FW Thorpe a few years ago and the co-chief exec said the firm’s cash allowed it to quickly bulk-buy components in the 2008 downturn because the firm was not sure if its suppliers would make it through the crash. So there are ‘hidden’ uses for surplus cash that may not be obvious to us normal investors. Something to be careful of course when using EV for cash-rich companies is to recognise part of the overall share price will be represented by that cash and as such that proportion of the share price won’t grow that much. The other part of the share price, representing the business, ought to grow more of course. As such, if a company has, say, 50% of its mkt cap in cash, then it may take some time for earnings to progress to a level where significant all-round share-price growth is delivered. Thanks for the response. Just to clarify, in general I think we use pretty similar valuation methods, it’s just I am less certain in how I should treat large, unproductive cash piles when relative to market cap. I certainly agree that EV is the way to go re valuation & if Castings had c.£5m-£10m net cash I’d be comfortable taking it all into consideration. It’s just the size of the cash pile here & it’s potential impact on valuation that I’m less certain about. I appreciate that large cash resources do have some value but I would disagree, in this case, that ‘cash just sitting there could be more valuable than earmarked cash, because the latter could be wasted’. It maybe the optimist in me, but whilst I can’t be certain, I try not to invest in a business where management will waste cash. In Castings case I feel confident that they are prudent users of cash. The same would apply to TW Thorpe. I’ve previously toyed with discounting an element of a large net cash pile to reduce my EV, but this never felt right. I think your last point that a ‘proportion of it’s share price represented won’t grow that much’ maybe the way I should think about it, & therefore influence how highly I rate the business.